Simon & Schuster, 9781416541639, 352pp. For more than two hundred years after William Shakespeare's death, no one doubted that he had written his plays. Since then, however, dozens of candidates have been proposed for the authorship of what is generally agreed to be the finest body of work by a writer in the English language. 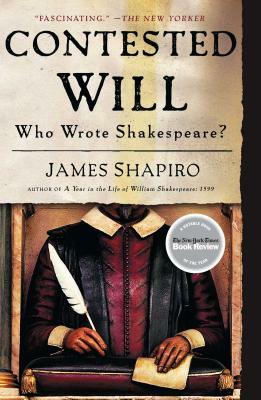 In this remarkable book, Shakespeare scholar James Shapiro explains when and why so many people began to question whether Shakespeare wrote his plays. Among the doubters have been such writers and thinkers as Sigmund Freud, Henry James, Mark Twain, and Helen Keller. It is a fascinating story, replete with forgeries, deception, false claimants, ciphers and codes, conspiracy theories--and a stunning failure to grasp the power of the imagination. As Contested Will makes clear, much more than proper attribution of Shakespeare's plays is at stake in this authorship controversy. Underlying the arguments over whether Christopher Marlowe, Francis Bacon, or the Earl of Oxford wrote Shakespeare's plays are fundamental questions about literary genius, specifically about the relationship of life and art. Are the plays (and poems) of Shakespeare a sort of hidden autobiography? Do Hamlet, Macbeth, and the other great plays somehow reveal who wrote them? "Shapiro is an engaging and elegant guide . . . a masterful work of literary history, an empathetic chronicle of eccentricity, and a calmly reasoned vindication of 'the Stratford man.'" "James Shapiro is an erudite Shakespearean and a convincing one. . . . A bravura performance." "It is authoritative, lucid and devastatingly funny, and its brief concluding statement of the case for Shakespeare is masterly."